Updating you on what I've read lately. I tend to read more when I travel (long flights), so I thought it was time to share the books I've read since my summer reading post -- while traveling to Australia, Fiji and New York. The only real reason I picked up The Fall was because I was in the book store at the airport and didn't have enough time to really look for a book. The title of this one caught my eye and it seemed short enough for me to read while on the plane, so I bought it. It's a bit more of a YA style novel, but it's fun for what it is -- and super easy to get through from start to finish. Nothing too memorable, but still fun. 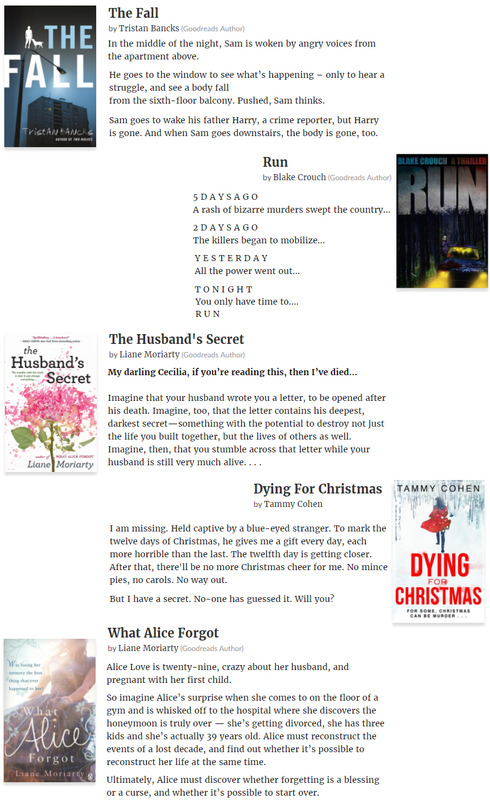 You'll probably notice that there's another Tammy Cohen novel on this list. You might remember I read When She Was Bad and then said I'd start on Dying for Christmas right after, which I did. This book comes with a twist that I seriously could not figure out ahead of time. But once the twist was revealed, I did start to feel like I had read a twist like that in books past. Also, there is another Blake Crouch novel here as well. He wrote Dark Matter on my previous list, which is seriously one of the best books ever written. Run is very good, but hard for it to live up to my previous read. Although I will say that it was very easy to visualize this book. I could totally see it as a limited summer TV series. 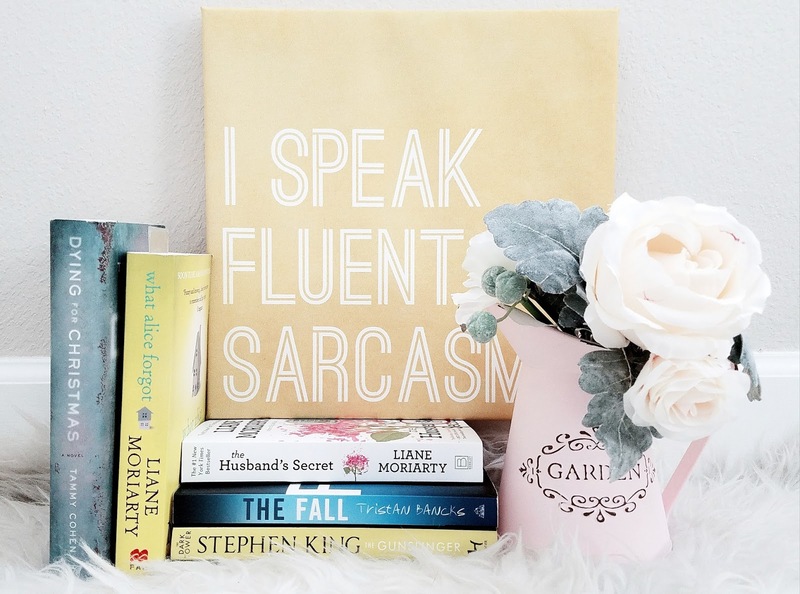 And yes, Liane Moriarty makes not one, but two cameos in this post. She is an author that always shows up on my Goodreads account, but I had no plans to read any of her books. Then Big Little Lies came out on HBO (read the best songs from the show here) and I was hooked. After I left Australia (where Liane is from), I stayed at a resort in Fiji that had a library full of Moriarty books. So I picked up The Husband's Secret and gave it a read. It was definitely my kind of read. I really enjoy books where a main character has a secret. The funny thing is, the secret is actually revealed fairly early into the novel so the rest of the time is spent wondering what the characters will do with what they know. Then my blogger babe Tanvi recommended that I read What Alice Forgot so I gave it a go as well. I liked that this novel gets right into the premise: a woman hits her head and loses her memory of the last 10 years. She thinks she's 29 and pregnant with her first child, but actually she's about to turn 40, has three children, is divorcing her husband and has no recollection of anything. The interesting thing about this book is analyzing how Alice deals with finding out how her life has drastically changed in the past decade and what she's willing to do to get it back to the way it was. And why is the name Gina so integral to the story? If nothing else, Liane Moriarty is making me want to read Big Little Lies. Many, many years ago, I had a friend of a friend who was really into The Dark Tower books. I mean, he was on high nerd level when it came to this book series. I never thought much of it. From what I knew, the books started off quite small and just got bigger and bigger with each new issue. Seemed pretty similar to the Harry Potter collection. As you can imagine, when I saw the first trailer for The Dark Tower movie, I was immediately reminded of my friend of a friend's enthusiasm for the novels. And even though I had never read a single word of the book series, I was quite intrigued by the trailer. How could you not be intrigued by Idris Elba as a gun slinger and Matthew McConnaughey as the mysterious man in black? But I actually still have yet to watch this movie or read the book. But I did buy the novel. Maybe I'll read it. Someday. I love that you always dedicate time to read. I always tell myself whenever you share this kind of post, that I need to read. I'm so intrigued by What Alice Forgot. I do have trips lined up so hopefully, I can start reading in the airport! My husband is currently listening to The Dark Tower audiobook. I need to get back to reading for the fall. So cool you got to read all these, Cheryl! They all sound pretty interesting, esp. The Husband's Secret. PS And my hubby read the whole Dark Tower series. I really want to read the books since we already have it at home. Not gonna lie...he didn't like the last book, but I found out a lot of peeps are divided with this King series. I love updating my reading lists for my commute. I have not read these, but I think I'd be interested in The Husbands Secret. I have seen Run at the bookstore but didn't pick it up, so I will check that out. Nice list. I have chosed 25 books to read last December 2016. Sad to say I have only read 2 and I am reading the third one now. I am such a slow reader. There are many distractions- movies, tv shows, social media, etc. I hope I find to read more. Nice list. Definitely checking out The Dark Tower Series and the movie! I love reading on planes, it is so relaxing! I place my head buds on and just get lost in my book- I Love it! (These days I travel with the littles-so my reading is interrupted often). Dying for Christmas has me so intrigued I am hooked! Oooh, What Alice Forgot sounds really interesting! These books all sound so good. I keep buying books but make no time to read them....I need to get better at it. I have the Husbands Secret but haven't read it yet. Currently reading "All the Missing Girls". I need to read more Liane Moriarty! Those all sound like such great reads! I am still meaning to read Big Little Lies. These all sound like such great reads! I wish I had time to dedicate to reading, but kids and work keep pretty crazy these days! I have been wanting to read The Fall! Going to pick it up today at the bookstore. Liane Moriarty books are perfect for traveling. Nice list!